Workforce mobilization has become a key competitive requirement for most organizations. However, enabling mobility is more than just providing laptops and mobile phones to users and sending them out into the field. It's about selecting the appropriate technologies and developing the right user experience. 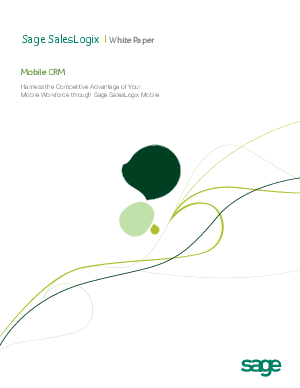 Harness the Competitive Advantage of Your Mobile Workforce through Sage SalesLogix Mobile White Paper will walk you through the emerging mobile CRM landscape to help you better understand the benefits you'll reap from deploying a mobile CRM solution, as well as the key requirements you'll need to consider to successfully move forward with your mobile CRM initiative.